Video games’ fastest hedgehog beats up a lot of other animals in his comic-book adventures. Humans, too. If you want to see the guys who’ve given Sonic his toughest battles in illustrated form, they’re all in one handsomely presented place now. Sonic's ultimate hardcover comic collection is BACK with Best of Sonic the Hedgehog Villains! This deluxe new installment to the smash-hit "Best of Sonic" series celebrates twenty years of comics, specials and mini-series with the baddest baddies the Sonic comics have to offer! Heroes are only as good as their villains, and Sonic's world hosts some of the most fearsome and loathsome characters you love to hate! 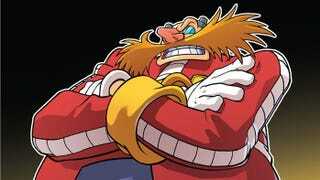 Root for the bad guy (just this once) in this Best of Villains collection featuring DR. EGGMAN, IXIS NAUGUS, the BABYLON ROUGES and many more in a must-have for any Sonic fan! Plus all-new cover art from Ben Bates with acclaimed painter Dave Devries, and insights from the Sonic creative team!